Family location at A PLACE AT THE BEACH III on Shore Drive in Myrtle Beach. 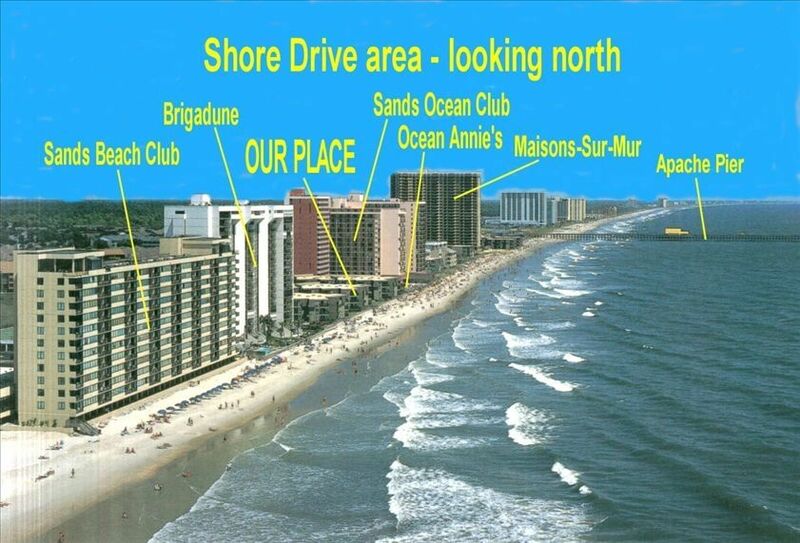 With 550 feet of ocean beach frontage on S.C. fabulous beaches of the Grand Strand. In the middle of restaurant row. Shore Drive is a cul-de-sac street with only renter or owner traffic, away from the heavy congestion but still close to everything. There are no access roads or dunes to cross to get to the ocean. When you walk out of the condo, your feet are ON THE BEACH. Walk another 150 feet and your shoes will be in the ocean. Ours is a second floor unit in in a 3 story building. Featuring an oceanfront covered balcony overlooking the ocean, pool, swash, and golf course. There are 2 outdoor swimming pools. Outdoor park benches, picnic tables, 6 charcoal barbecues, 2 outdoor showers, pool/deck chairs. Gated parking. This is a Non-Smoking unit with smoking permitted outside on the covered balcony only. Bring your own bed linens, pillow cases, towels and wash cloths, or they can be supplied for an added nominal fee. FREE high speed DSL WIFI Internet access availability so bring your own computer/laptop that is WIFI configured and compatible. There is a Life Guard on duty at the ocean from Memorial Day through Labor Day. Less than two miles to Tanger Outlet Mall, Super Wal-Mart, Kroger's, Straw Market and Restaurant Row. Sorry but NO PETS, MOTORCYCLES, TRAILERS, BOATS, CAMPERS. Minimum age to rent is 25 yrs old. Maximum capacity 6 people maximum unit occupancy. ALL RENTAL RATES QUOTED BELOW INCLUDE ALL TAXES AND DEPARTURE CLEANING FEE. ALL RENTALS ARE FOR A MINIMUM STAY OF 7 DAYS FROM SATURDAY TO SATURDAY. My wife and I are retired and absolutely love Myrtle Beach. She was a Registered Nurse and I was an Industrial Engineer prior to our retiring. We have rented condos every year for about 15 years prior to purchasing our condo unit in 2002. With 10+ years of being a Myrtle Beach renter prior to our condo purchase we felt that the SHORE DRIVE area was the most in demand area of the entire Myrtle Beach rental area preference. The geographic location was in the middle of everything that we wanted. Our 2 children and 4 grand children who come here every year feel the same way we do that Myrtle Beach is a fantastic vacation time with family. Our condo is located on Shore Drive which is a quiet cul-de-sac street with only condo owner and renter traffic on it. That being said you have 2 options depending on your wants and needs. You may have a very quiet, no traffic noise, no stress vegetative vacation totally relaxing and getting a sun tan OR within a 5 minute drive you will be in the middle of all the Myrtle Beach action. Live theater, restaurants, miniature and regular golf, factory outlet malls, shopping, and other great attractions of interest. Or do both, this location is great for it. Winter time renters (Oct through Mar) will enjoy that every room has electric baseboard heaters installed to give you quiet (noise free) efficient electric heating of the entire condo without using the noisy 2 A/C units operating in their heat mode. There is a fantastic view of the beach and ocean from the condo covered balcony. From the balcony the ocean and swash view is fantastic. You can sometimes see the dolphins frolicking in the surf. No roads to cross. Condo is right on the ocean & beach. From the balcony you can see the Singleton swash, a nature preserve, and view the 2 dozen + Egrets that make their home there. There is no telephone at the condo so bring your cell phone to make all your calls. Winter condo heating is supplied by electric baseboard heating in every room for silent, efficient, balanced heating comfort in every room without the noisy A/C units operating in their heat mode. Bring your own bed linens, pillow cases, towels, and wash cloths They can however by request be provided at an additional nominal cost. Gated parking only at the condo parking area. All my renters have FREE high speed DSL WIFI Internet access availability. Bring your computer/laptop that is WIFI configured and campatable. In master bedroom, 2nd bedroom and living room. 3 TV sets. (3) 27' TV in living room + 20' TV in master bedroom + 17' TV in second bedroom. All are cable ready. There are some sand toys (buckets, scoops, molds, etc) for the tots to play with in the sand and some boogie boards for the teens to play with in the surf. Covered balcony featuring spectacular view of ocean, pool and Singleton swash. Entrance to balcony is from living room plus entrance from master bedroom. There is 2 world class golf courses within a 5 minute drive from the condo. The unit is on the second floor. There is NO elevator. Unit is not handicapped accessible. There are 2 private swimming pools on the property for the renters to enjoy. Full kitchen w/ service for 6, Coffee maker, Blender, Oven/Range, Iron & Ironing board, All cooking utensils provided. 27' cable TV in living room. Master bedroom has KING SIZE BED, private bathroom, 20' TV & private access door to covered balcony overlooking the ocean, swash & pool. 2 TWIN BEDS in 2nd bedroom + 17 inch TV. Living room couch pulls out into a QUEEN SIZE BED, Ceiling fans in all rooms, There is a coin-operated laundry on 1st floor that socks up quarters. A/C for summer cooling and electric baseboard heaters in every room for silent, efficient winter heating comfort without the noisy A/C units operating in their heat mode. Just what we expected. Not super fancy but comfortable and clean. We have been coming to this complex for several years and have never been disappointed. It’s not shiny and new but it’s comfortable and clean and well maintained. And it’s not crowded. Great for a family vacation. We loved the location and space, but it was not very clean. Stained carpet and bed covers along with furniture was smelly and stained. Property was well stocked with every thing we needed. We would look for a more updated space next time. It was easy to contact owner and we received info easily. Thank you for your review concerning your stay at my condo. During the time I owned the condo (about 20 years) and have had 25+ five star reviews submitted by renters who stayed there in the past. It was quite a surprise to get a less than the 5 star review that you submitted. Your comments are of the highest priority too me and will be addressed and taken care of immediately. I strive to present my condo to renters with as comfortable an environment as possible similar to their living room at home with rugs on the floor and very comfortable furniture to relax in as apposed to the sterile environment of wicker furniture with cushions and completely tiled floors, etc. Thank you again for your review. This condo is in a great location. It's right on the beach and close to major shopping stores like Tanger Outlets, Wal-Mart's and others. Unfortunately, being avid golfers, this past month of March 2018 was the coldest we ever had in 20 years so for that reason it wasn't our best golf vacation. the condo is very comfortable and perfectly located for us. We enjoyed every minute we were there. This was our second year renting the condo and plan to go back every year. The place was very clean and had all the items needed to keep the place that way. Great view with easy access to beach, pool and parking lot. Bill was easy to work with and response time with emails were quick! No flat screen TV's..but for us we didn't mind. Only stating because that's a preference for many. Loved it! Location is perfect for everything in myrtle. Already booked for next year!! ALL QUOTED RENTAL RATES INCLUDE ALL TAXES AND DEPARTURE CLEANING FEE. All rentals are for a minimum stay of 7 days and run from Saturday to Saturday. Daily rentals are not available.